Lewis Hamilton made an uncharacteristic error during Saturday qualifying at the 2017 Brazilian Grand Prix, losing control of his car and crashing into the barriers before even setting a time. As a result, he had to start from the pit lane on race day, all but assuredly robbing him of a shot at the win—or even a podium. Ferrari’s Sebastian Vettel looked like the man to put it on pole in the final qualifying session until Mercedes’ Valtteri Bottas snubbed him by 0.038 seconds, but the former was quick to rectify that the following day. Vettel had the better start, got about halfway alongside Bottas during the run down to the first corner, and squeezed his car through under braking. After that he was off and though the gap between the leaders was never great, Vettel always seemed in control, as though he had more in reserve should he need it. The real race was taking place at the back. Hamilton easily had the best package of the grid on Sunday. Because he was to start last anyway, Mercedes equipped his car with its latest spec power unit and apparently allowed him to deploy some of their normally sparsely-used engine modes for more power—after all, with only two races to go and both championships already sealed, it wouldn’t represent much of a reliability risk. 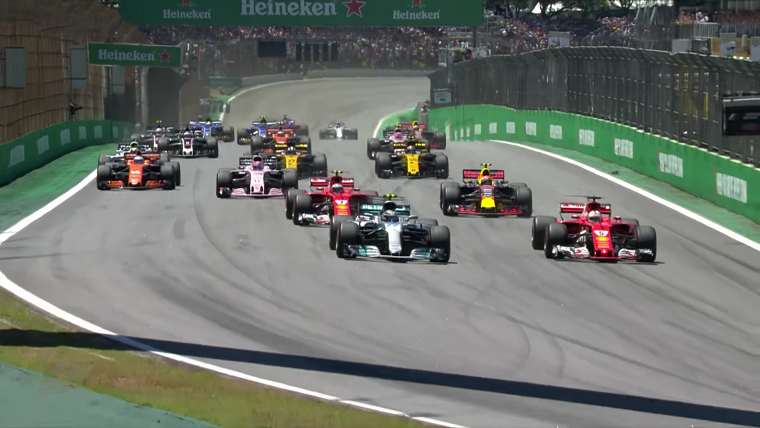 Consequently, Hamilton was absolutely flying at the São Paulo circuit, making quick work of anyone who came in his way and posting mind-bogglingly large deltas to the cars around him in the speed traps. It didn’t take long for him at all to slot himself into fifth position with only Red Bull’s Max Verstappen, the two Ferraris, and his teammate ahead of him. 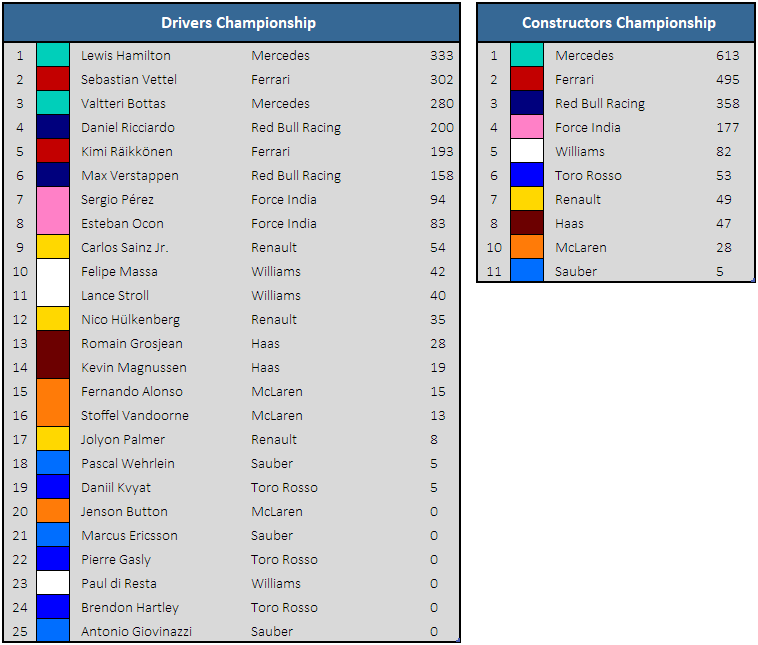 After catching and passing Verstappen, he only had to do the same with Kimi Räikkönen to secure a podium finish. He may have been too eager, however, and locked his brakes several times into the first corner while closing in on the Finn, compromising his subsequent charges and ultimately allowing Ferrari to hold on to its double podium finish. Meanwhile, it was a bad day for the Haas drivers. Both were involved in first-lap incidents, and Kevin Magnussen, Stoffel Vandoorne, and Esteban Ocon all retired before they could go around the circuit even once, which ended Ocon’s record-breaking streak of completing all Formula One races he had ever competed in. 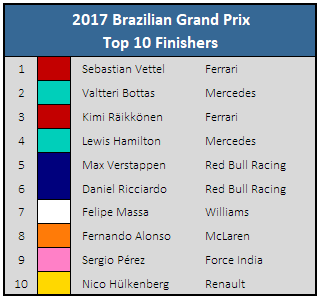 Fernando Alonso did all he could in his McLaren Honda to overtake Felipe Massa for seventh place but was ultimately unable to get by the Brazilian, who was keen on putting on a good show at his home race before he retires in two weeks after the final race of the season takes place at Abu Dhabi.